MF Communications is pleased to now be able to offer customers the new NEC UNIVERGE 3C phone system as part of our product suite. As an NEC partner, MF Communications has been chosen as one of the few preferred resellers of the 3C and is able to supply, install and maintain the whole system now. With modern businesses requiring more staff productivity and reduced costs, and employees needing more working flexibility and collaboration tools, the NEC 3C can give all this in one package. 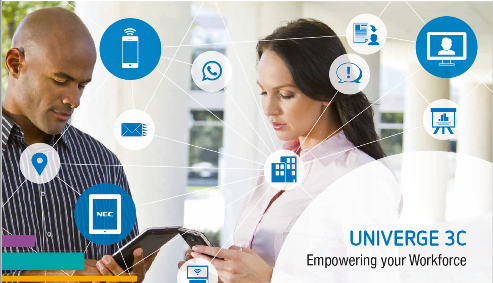 It is a unified communications solution – combining all current business communications platforms. From connecting with colleagues on almost any device and anywhere to collaborating on documents remotely and taking part in audio conferences on the go, the 3C will keep management, IT and employees happy. MF Communications is a telecommunications specialist providing phone hardware, parts and accessories, as well as network services – phone lines and calls, broadband, mobiles, VoIP and inbound – and maintenance services to businesses locally, nationally and internationally. Established in 2000, the company has gained a reputation for excellent customer care and for providing quality products and services. MF Communications is ISO 14001 accredited for being an environmentally responsible organisation and among others, is a member of the Federation of Communication Services (FCS) and the Federation of Small Businesses (FSB). Find out more at www.mfcomm.co.uk.